I’d heard a lot about this one over the past year, and I was definitely drawn to it—both for the typographic cover that I love so much and also for its synopsis. To me, it sounded like anti-TFiOS. Which, of course, isn’t to say that these two books are the same and should be compared. Really, I’d say that the one true thing these two books definitely have in common is that I thoroughly enjoyed them. 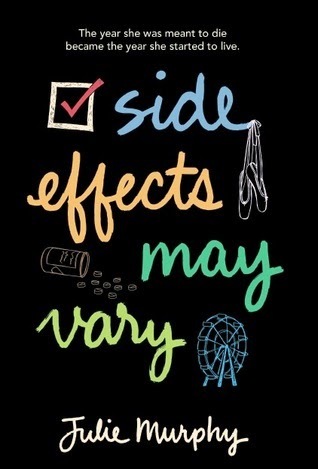 From what I’ve been able to gather from other reviews, the side effects that vary from Side Effects May Vary are the opinions of main character Alice Richardson. I often use reviews to help me weed out what I might like from things that aren’t my kind of bag, but I heard over and over again that Alice was “an unlikeable narrator.” After only a few chapters, I could see why so many people would think that. However, that is precisely why I loved this story so much and why I felt it something I wanted to read. Everything isn’t always as pretty as you want it to be. Life is messy and uncomfortable, and people are far more likely to do or say the exact thing you don’t want them to do or say. Plus, I think Alice had plenty of reasons to feel freaked the eff out. It’s clear in her Then chapters that she thought she was shuffling off this mortal coil. When the only thing you’ve known is completely shattered in that way, even in a good way like Alice’s was, that is still a very hard thing to handle. Sure, I didn’t always like Alice. Sure, I felt like she used Harvey and wanted him most when she couldn’t have him. But that didn’t make her any less compelling or interesting or, honestly, likeable in my eyes. While we’re on the subject of Harvey, despite the fact that Alice told him she only used him, I never felt sorry for him, because he stated often enough that he knew exactly what Alice was doing. Granted, he didn’t always feel the full impact of it until it was too late, but he’s not a dum-dum. He’s just a romantic. If anything, seeing Alice through his eyes showed more facets of her, more ways to see that she was spiraling and needed Harvey’s constancy more than anything else. Their relationship didn’t give me the Feels; it gave me the Thinks. I cannot stop thinking about Alice and Harvey. I’m glad they love the Question Game, because I have so many I’d like to ask. I’m grateful I gave this book a chance. If you’re still on the fence, I’d recommend a listen to Julie’s interview with Sarah Enni on the podcast First Draft (which is what pushed me over the edge). I know I’ll be here for whatever character Julie brings me next.